The story of Balarama and Monkey Dvivida (Dwivida or Dvividha) is found in the tenth Skandha Chapter 67 of the Srimad Bhagavad Purana. The story takes place when Balarama and Krishna have grown older. Dvividha was the friend of Demon Narakasura who was slain by Sri Krishna and Satyabhama. To avenge the death of his friend, Dvividha caused havoc in Anarta. He disturbed the sages, killed people and destroyed properties. Dvividha was a very old monkey and he was the brother of Mainda and was a minister of Sugriva during Treta Yuga – the Ramayana period. He was so strong and powerful that he used to lift up small hillocks and throw it on villages. He had the strength of ten thousand elephants. Once he dived into the sea and with his arms, he churned the waters and it submerged a nearby region. He used to throw men, women, and children into caves and close up the mouth of caves with huge boulders. Balarama, once during his excursions, reached the Raivataka Mountain a place near Anarta. Dvividha heard sweet music coming from the Raivataka Mountain. There he saw an intoxicated Balarama singing and dancing amidst beautiful women. Dvividha entered the area and started jumping from tree to tree and making faces at the women. He kept on grinning and chattering causing great disturbance. Dvividha then started to attack the women. Balarama became angry and he threw a stone at Dvividha. The big and strange looking monkey evaded the stones. Dvividha then grabbed the pot of Varuni wine, the favorite drink of Balarama. He broke the pot and then attempted to grab the garments of the women and tear them. Ill-treatment of women and breaking of the containing his favorite wine made Balarama angry. His anger knew no bounds. Balaram took up his club called Sunanda and his plough to put an end to Dvivida. Dvividha broke a Sala tree and hit Balarama on his head. 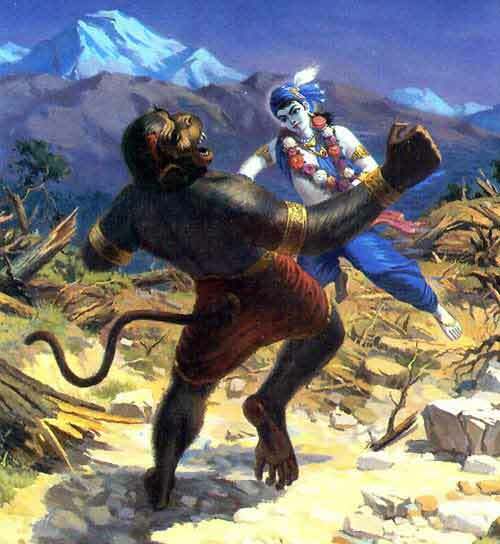 Balarama struck the monkey with his club. Blood began to flow from the wound but the giant monkey ignored it. He tore up tree after tree and threw them at Balarama who broke each one of them. Dvividha then began to throw stones at Balarama. They were like raindrops for Balarama. Dvividha now came near and started to wrestle with Balarama, he hit Rama on the chest. Rama dropped his weapons and hit him on the chin. That single blow was enough, Dvividha fell and blood flowed from his mouth like a river. The life of Dvividha ended in that single blow and the region of Anarta was freed from his terror.